Lately, my husband and I have been pretty good about doing a semi-regular weekly date night. Granted, it's taken us almost six years to get to this point, but as they say, good things come to those who wait (or are just too tired to go out). Typically we go to the movies and try to stay awake until the end. Once in a while we’ll go to dinner. Also on the list of possibilities I have ballroom dancing, bowling, and I recently added nighttime paddle boarding! I once asked, “What do you think of doing a paint your own pottery night?“ To which my husband responded, “What do you think of doing a build your own computer night?“ ‘Nuff said. Recently, however, we stepped out of our norms a little bit. For a year now my husband has been saying he would take me to a vegetarian Indian restaurant in the Manama souk that friends recommended. And it was finally happening! We parked by the Intercontinental Hotel and walked a few blocks into the heart of the souk. At this point I realized it had been about nine months since I had been here and I’ve probably only made three or four visits in total, so I did not know it well. And from past experience, I knew my husband didn't know it well either. But I let him lead and we wandered through back alleys and passed open shops selling perfume and watches and plastic buckets and closed shops proclaiming necessary wonders behind shuttered doors. 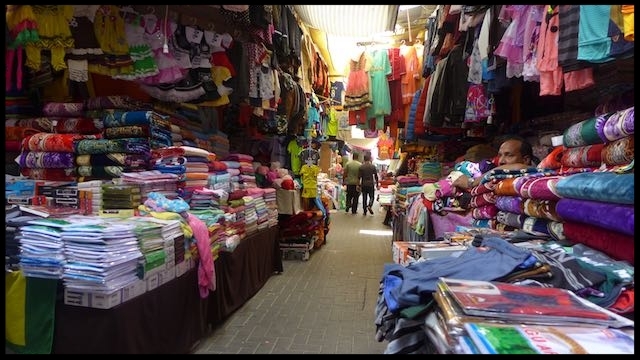 Manama souk has vague references to Cairo‘s Khan el Khalili, but it doesn’t have the charm or the intrigue or the wonder or the filth or the odors or the masses of people. But for a small city it has maze-like back alleys in areas where I find myself grateful to be following my husband and not exploring on my own, which gives it just enough of a sense of adventure for a good date night. We circled around for a while turning this way and that, passing bundles of Indian and Pakistani men working and socializing, passing Bahraini families with protesting children, passing hawkers offering Rolex watches on every corner. I wonder why they think we need a Rolex so badly? After about 15 minutes I strongly suggested my husband ask for directions. We didn’t know the name of the restaurant but we knew we were in the general area as we were in the gold souk. He popped into one jewelry store and they told us to make a quick right turn and then an immediate left and we would see it there. They were right! 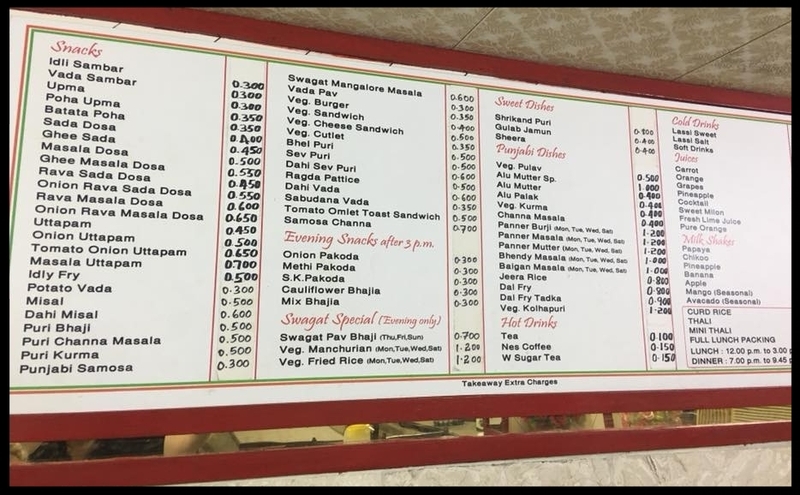 Of course, we found ourselves at the back door to Swagat restaurant, but they kindly opened the door for us and shuttled us past the industrial sink and Coke machine. There were three or four tables in this area but they gestured and we climbed some incredibly steep stairs that were more ladder-like than stair-like. Upstairs there were twice as many tables and I instantly noticed there were no women anywhere, only men. But we were then shown into the “Family Room“ where there were five tables set up for women and families to eat separately. We chose one that looked relatively clean and sat down. A man came over and gave us a box of tissues and two metal cups and then stared at Ron. I was wondering if we were going to get menus but then Ron pointed to the wall behind my head and I realized their extensive all-vegetarian menu was right there. I also realized I didn’t recognize about 90% of it. Ron ordered the Thali meal and a large bottle of water. Friends who had recommended the restaurant had also recommended the Thali dish, which was a selection of nine different dishes, plus white rice, plus a variety of bread. And, like the Olive Garden’s endless pasta bowls, you could apparently ask for seconds and thirds and beyond. All for just 1BD ($2.65). Astounding! We didn’t have to wait long until the man returned with a metal tray full of a variety of things to try. He also handed out two slightly battered metal plates that were off kilter just enough so they spun when you tried to scoop up your food. Added entertainment! Everything was delicious. Some of the spices had a bit of a kick to them so we reminded the man again that we had asked for water. He returned a few minutes later to ask whether we wanted cold water or room-temperature water. We asked for cold. As we ate, the room started to fill up. A family with a toddler sat down at the table next to us and plunked the child on top of the table, dirty shoes and all. Immunity boosters on date night, perfect! We happily finished our little bowls and decided not to partake of seconds despite the deliciousness. I suggested we ask for the check but my husband pointed out we were still waiting for our water. So we chatted and waited a little longer and watched all the tables fill up. I finally pointed out the obvious, that we were never going to get our water and that I felt it was time we should leave as I wanted to do a bit of shopping in the souk. So we flagged the man down and got the check. To keep the romance alive my husband suggested we go Dutch, so I threw in 1BD for a tip. We climbed carefully down the ladder stairs and walked out the front door instead of through the kitchen. We wanted to see if we could find it next time and actually come through the front door. We then started meandering through the streets still being offered a Rolex at every opportunity. I wanted to buy some traditional Bahraini dresses for the girls. I had heard from friends that the sellers would try to get 10 BD from foreigners, but that we should not pay more than 3-4 BD. I stopped in one shop and looked at some and when I asked the price he said 10 BD. I said that I had heard the local price was 4 BD. He hemmed and hawed but wouldn’t budge. I said that was fine and we left. We looked in another shop but they were more pageant-like than traditional Bahraini so we moved on. In the third shop they had a nice selection of colors and styles and sizes. I picked two out for our girls and one for a friend and then started the bartering process. No surprise, he started at 10 BD. I told him that I’d offer 4 BD. He went down to 8BD. I stayed firm at 4 BD. As is the custom he started bagging them up as if the sale was done. I said I give him 15 BD for three. He countered with 20 BD. I grabbed another dress and tossed it on the pile and said I’d give him 20 BD for four dresses. He asked for 22BD. At this point I relented and gave him the 22. It’s been a few years since I've truly gotten to barter like that and it was fun to flex those muscles again. The key thing is that you have to be willing to walk away. And in all honesty I didn’t want to go through this in another shop so I was willing to pay the extra few Dinar. My husband then said he wanted to get some lemon mint juice so we stopped at a corner store. We looked at the extensive menu and saw that they were offering chikoo milkshakes. We had seen this at the restaurant as well so my husband inquired as to what chikoo was. They showed us this small round brown fruit. They cut it open and offered it to us. It was delicious but I don’t know if I can describe it. It was soft like a fig, but fleshy like a plum, but brown. Physically it was not particulary appetizing but it tasted delicious. So my husband got one of those as well. While they were hand-making and squeezing and stirring everything I started to look at the adjacent shop. He was selling watches (who isn’t?) and shoes and socks. There was a snake-like string of slipper socks for kids hanging down so I started to pick through them and after unhooking a whole pile of them I chose three and handed my money over. By this time my husband had his freshly-made drinks and we started to wander back to the car. We were following the lights of the skyscrapers high above the rooftops to find our parking lot. We wandered down one alley and came to a shop selling T-shirts (and watches, yes, watches) and in one last fling we bartered the seller down from 8 BD to 5 BD for a Bahraini football jersey for my husband. I doubt he’ll ever wear it but it makes for a good story. All in all, it was a fabulous date night. Might be hard to live up to, but maybe we'll hit a movie next time and then try for one adventure per month. Besides, we still need to get that Rolex.